The Prince Edward Island Home and School Federation released highlights of its 2013 parent engagement survey. This survey of parents having school-aged children in PEI explored issues related to parent engagement in their children’s education. From January to March 2013, the Federation undertook the "Parents as Partners in Education Survey". The survey identified needs, views, and perceptions of the parents and guardians of children attending public school system on PEI. A total of 692 respondents are included in the analysis, representing parents of 1,133 children in Kindergarten to grade 12. Parent’s engagement with the school revealed that ninety percent (90%) of parents or guardians attended parent-teacher interviews all or almost all of the time. Twenty-seven percent (27%) of parents and guardians participated in their local Home and School Association or Parent Council. As well, ninety percent (90%) of parents attended events and activities at the school with almost half of parents attending events or activities all or almost all of the time. Eighty-eight percent (88%) of parents have volunteered with fundraising activities for the school while 65% have volunteered to help with school events and activities. Only one-fifth of parents volunteer in the classroom. Busy schedules are large barriers (68%) to parents being involved in their child’s school. Other barriers to involvement are childcare needs (15%) and having little information about involvement opportunities (12%). Transportation challenges, influence from child not wanting parents to contact schools and worry that their child will be treated differently by school employees are least significant barriers to becoming involved in the school. Up to thirty-eight (38%) of children have been bullied or harassed at least once or twice in the school year while up to 13% of children are bullied or harassed at least once a month. The most common forms of bullying or harassment are verbal and social. Parents report that their child has not bullied or harassed others (68%). Parents reported that the P.E.I. Home and School Federation should be influencing or raising the profile of bullying in schools (90%). Teacher and principal performance assessment (71%), structure of the school year calendar (68%), rezoning schools (67%), time available for eating school lunch (65%), and the Students Achieve system (61%) are issues in which parents believe the Federation should be influencing. About half of the parents think that the structure of the school day and report cards are issues where the Federation should influence. The results will be used by the federation to develop new initiatives in support of improved parent involvement in education. The compete survey results can be found on the federation’s website - Parents as Partners in Education in PEI. Summarized from a PEI Home and School Federation Press Release. 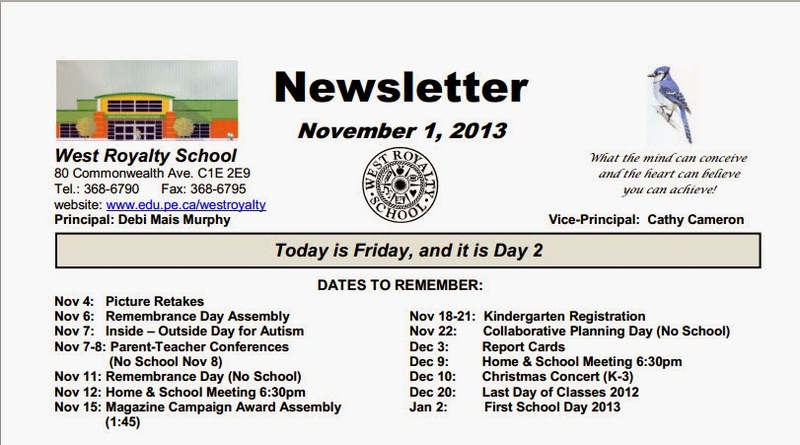 NEW West Royalty School Website NOW ONLINE! 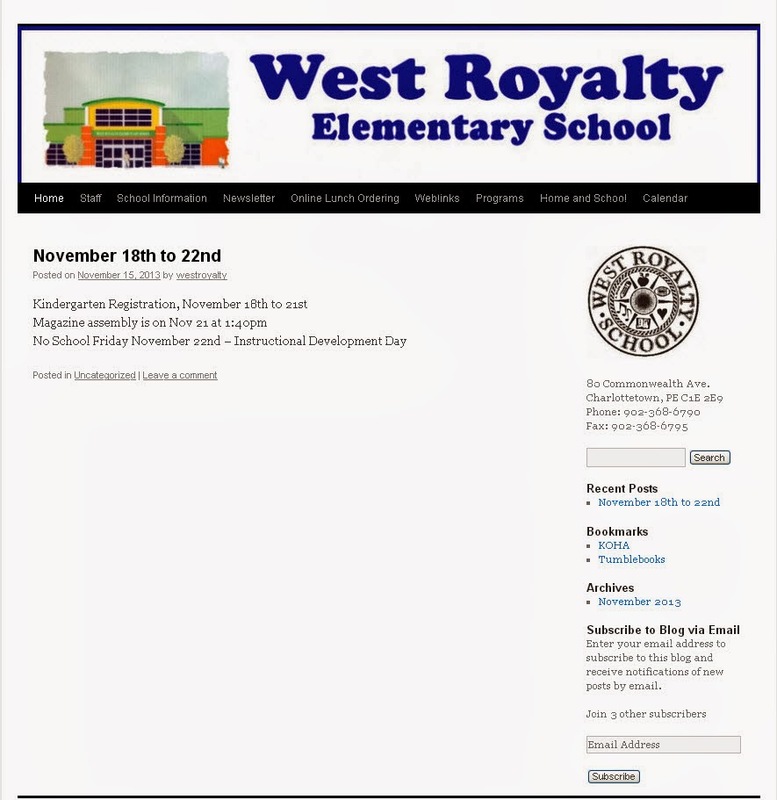 The West Royalty School website has recently been updated. Click here to visit the new site and, while you're there, don't forget to subscribe (lower righthand corner of site) to automatically receive e-mail notifications whenever the site is updated. Please note that the original site will still automatically default to the new site when accessed but you may need to hit the refresh button on your browser. Many thanks to Tracey Smith, Grade 3 Teacher, for her work in maintaining and updating the school website. Don't forget to order your CRESTED SCHOOL CLOTHING! Just in time for Christmas! Show your school spirit and pride by purchasing some crested clothing. Orders will be filled before the Christmas holidays. Leave a contact number and indicate "GIFT" if you don't want the item(s) sent home with the child. Return the completed order form and cash to the school office on or before November 21st. Complete the ENTIRE form for accuracy! (colour, size, quantity, and contact info). NO orders will be processed after the 21st. CASH ONLY (No cheques accepted). This is a Grade 6 fundraiser. All proceeds from the clothing sales will go towards offsetting costs of the end of the year activities for our Grade 6 students. Student Academic Achievement - Your Comments Please! Cynthia Fleet, Superintendent of the English Language School Board, will be meeting with the Home & School presidents of the Colonel Gray family of schools next week. The purpose of this meeting is to engage in a discussion about student academic achievement, allowing us the opportunity to share positive experiences and challenges in this area within our school community. One positive initiative undertaken by our association that has impacted student academic achievement. Two challenges that must be addressed or overcome in order for student achievement to increase. If you cannot attend the meeting, please feel free to provide feedback by forwarding your comments to westroyaltyhs@gmail.com. 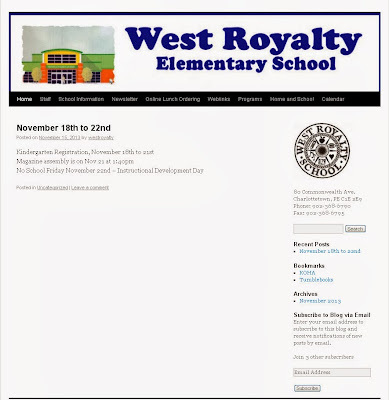 The West Royalty School Newsletter has moved to a printer friendly online version to be environmentally friendly and save on school paper and duplicating costs. If you do not have regular access to the Internet, please inform your child’s teacher and a hard copy will be provided. 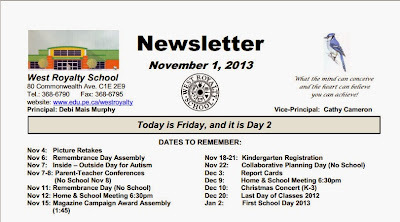 The newsletter is being posted at the beginning of each month on the school's website.